There are now so many ways for a magazine to brand itself. There is, of course, the print edition. Even for the most digitally savvy publication, everything usually starts there. But there’s also the web edition, the mobile edition, the digital replica. Then there are the social media feeds, events, videos and newsletters. So which comes first? I don’t think I know anymore. But one thing that has not changed is the magazine cover. Think of it as the front door to a magazine brand. Sure, it means very little for the reader who drops into the website (In fact, on many magazine websites, you have to work hard to even find a mention of the magazine). Subscribers, be they print or digital, have already ponied up money for the magazine so they’re going to get that issue no matter what. So why, even in this day and age, is the cover so important? Because it is the front door of the magazine. It says to potential readers who you are, what you are about. What’s in between the covers. Most importantly, if your reader picked up the magazine at the newsstand, they paid full cover for that one issue. Sure, you could have subscribed to Entertainment Weekly for one year for $5.00. But if you went to the newsstand and picked up the June 17 issue with the TV show Mr. Robot on the cover you paid full price, $4.99, for that one issue. So that means you must have really liked Mr. Robot and Entertainment Weekly. Right? As far as I am concerned, there is little more unsettling in the world of cover design when a well known magazine blows a flat note and puts out an unattractive cover. What were you thinking? Why did you do that? Sometimes it’s groupthink. Sometimes it’s an experiment that just went wrong. Sometimes it’s just that there was nothing else to work with. 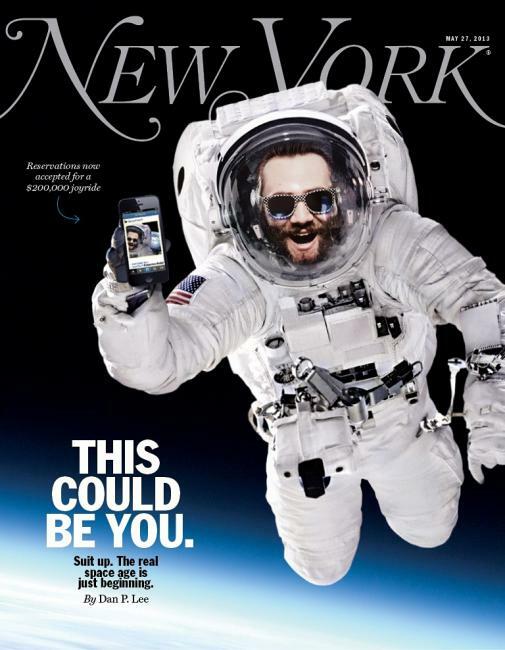 Last year, the Foredeck introduced the “Most Egregious Cover of The Year” of the year. The response from readers was pretty interesting. Now that we’re halfway through this year I thought I’d share with you what I think (You’re entitled to your own opinion of course) are the covers that that have made me wrinkle up my nose and wonder what went wrong. The only real issue here is the simple fact that you have to stop and squint to read part of the cover line. What they were trying to tie together was the National Parks 100th anniversary and their list of 100 things to do in the national parks. Most likely this looked way better on a computer screen than it did printed on paper and placed on a newsstand. Fortunately for Outside, they publish twelve times a year and from my perspective they usually hit triples and home runs. Let’s leave aside the potential political debates about this issue. They are immaterial for the purposes of this particular post. Sometimes black and white covers can work well. Heck, the Foredeck has listed some in times past. But there’s just something creepy and foreboding about this particular one. Even if Donald Trump weren’t running for president, the image of him lurking in the background is just….off. Don’t look over your shoulder Melania…. File under “An Unlikely Mess.” Who doesn’t love English model-actress Cara Delevingne? But why dress her up as an emoji? Let’s hope her new movie does better. Taylor Swift and Vogue have a long history together. I made their February 2012 cover featuring Taylor Swift as my #1 cover from the Foredeck that year. Usually Swift on the cover is instant attraction on the newsstand. It’s not that one of the most popular and powerful singers in the world can’t go out and change up her look. But in this photo, otherworldly looks unrecognizable. I’m not opposed to red backgrounds. In fact I love primary colors in the background. But this one…. To me Chicago Magazine is the epitome of a successful city book. I look for the latest edition of Chicago Magazine every month when I’m out at retail. Usually their covers are reliably good. It’s as if they take to heart every single CRMA presentation ever given and then make it better. “Top Doctors” editorial is generally a top newsstand seller for most city publications. Most “Top Doc” covers feature some sort of generic doctor on the cover so it’s understandable that Chicago tried to do something creative. But this? Should we call Spiderman and let him know that Doc Ock has invaded the Second City? The good news is that for every flop of a cover, there is usually a redeemer or two. Chicago Magazine has published several very good covers since January 2016 and for the record, may I show you what I think is one of the very best covers of 2016, Chicago Magazine’s July 2016 cover. Featuring a puppy. Who doesn’t love a puppy? Just remember. The cover is the front door. You want curb appeal. You want people to spend full freight on that copy. You want them to love it so much that they’ll turn around and subscribe. And subscribe to the newsletter. And pay for a ticket to your event. And buy your “Buyer’s Guide.” And subscribe to your YouTube feed. It is hard to believe that we are already well into the fourth quarter of this incredible indescribable year. As we approached the end of the summer, I put out what I thought were the top ten contenders to date for the best covers of the year. In spite of falling circulation, dire warnings of the end of the industry, a new way to calculate the worth of our business, and endless chattering and clattering about who we are and what we should be doing, our industry still produced beautiful covers and wonderful editorial to go with it. So for your consideration, here are some more potential candidates for the upcoming completely biased, highly subjective, unscientific list of the best magazine covers of 2014. 1) This particular cover of Essence Magazine has been on my shortlist from the first moment I saw it on the racks in a nearby Jewel-Osco supermarket. Let’s leave aside all the politics and perhaps even pretend for a moment that the figure on the cover is not our First Lady. Heck, let’s pretend for a moment that I didn’t just spend some time listening to the editor of this magazine hold an entire auditorium of publishing professionals and students spell bound for forty-five minutes at the last ACT conference in Oxford, MS. This is simply a great cover. 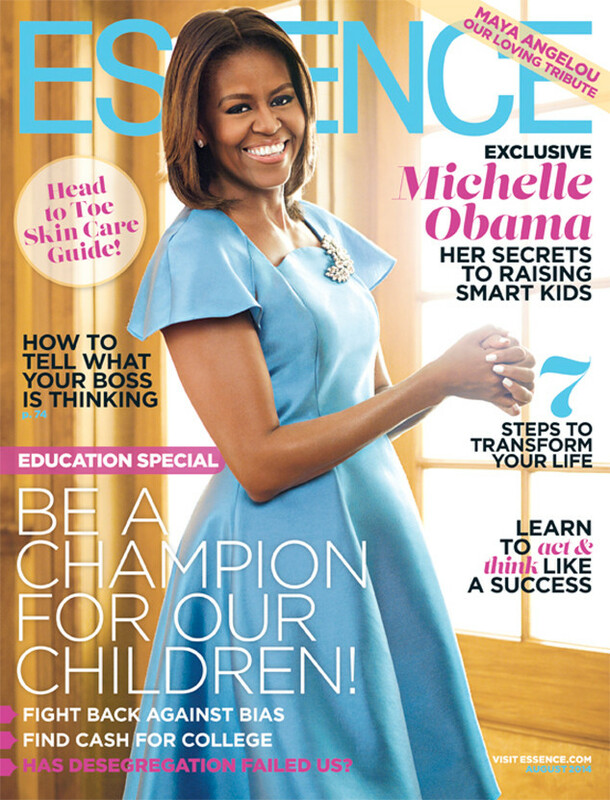 Smiling, inviting, intriguing cover model (who is also the First Lady)? Check. Great colors? Check. Great cover lines? Check. Banner? Check. Done! It just makes you want to smile back. 2) Have a seat. 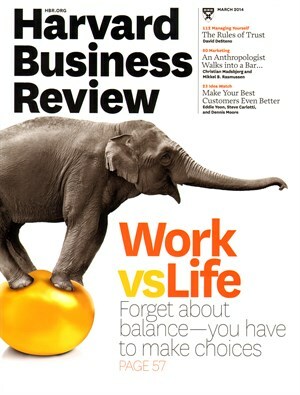 Did you know that the Harvard Business Review has a circulation of more than 200,000 copies? Did you know that they sell more than 40,000 copies per issue at the newsstand? At a cover price of $16.95? With an average subscription price of more than $90.00 per issue? Well now you do. And how about this awesome cover? So how do you feel about that $10.00 sub offer that comes with a tissue thin t-shirt made in China? 3) I equated the end of last year with the sound of a piano dropping. The news that New York Magazine was cutting its frequency was purported to be another giant piano crashing onto 5th Avenue. But in the end it was more like a ten minute ground blizzard. Was this an end to the magazine’s creativity and editorial coverage? Hardly. Take a look at the June 2 cover featuring the collaboration between actresses Shailene Woodly and Brie Larson. 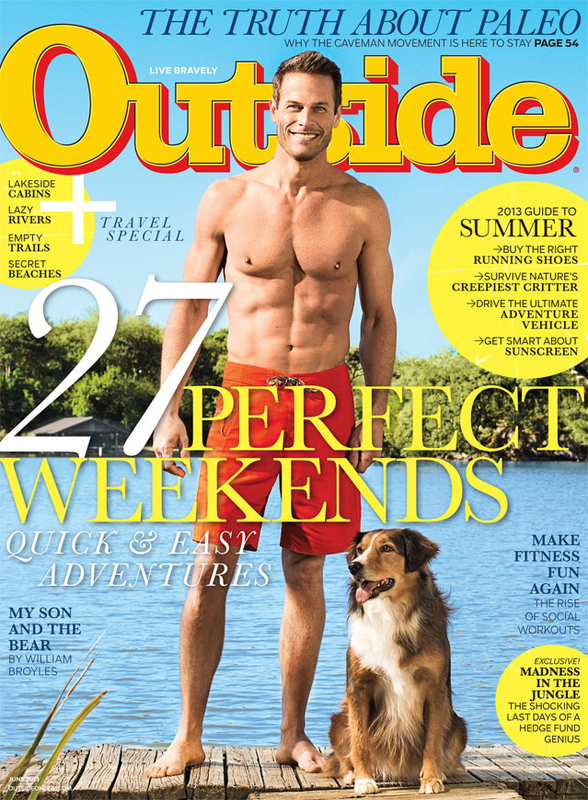 4) Outside Magazine has a long history of putting out creative and engaging covers. It’s a frequent visitor to these pages. This year, there are several that I think could make the final top ten, but a copy of the February issue featuring Olympic medalist Julia Mancuso still dominates my office magazine rack. 5) What is it with city magazines and food covers? I’m pretty sure it has something to do with the mouth-watering pictures of delicious food that you can actually get somewhere down the road from where you live. 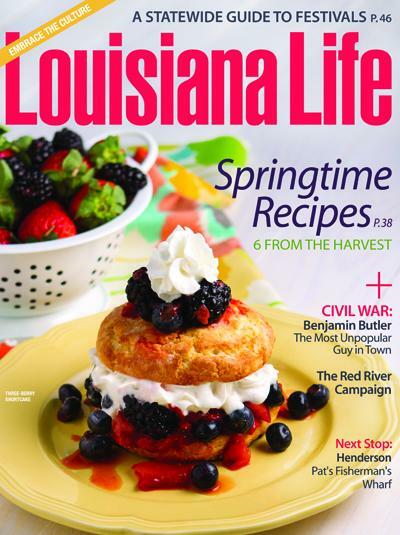 After the incredibly cold and miserable winter we suffered this year, how could you not get excited by seeing the luscious “Springtime Recipes” featured on their March/April issue? 6) While some history nerds had fun pointing out that John Hancock did not sign the constitution that graces Julia Louis-Dreyfus tailbone, the fact remains that this is an excellent cover. Is it controversial? Yes. That is sometimes what makes a cover great. 7) We often hear that dark covers, covers with a black background disapear into the swirl of color on the newsstand. But as so often happens with convential wisdom, there are exceptions. 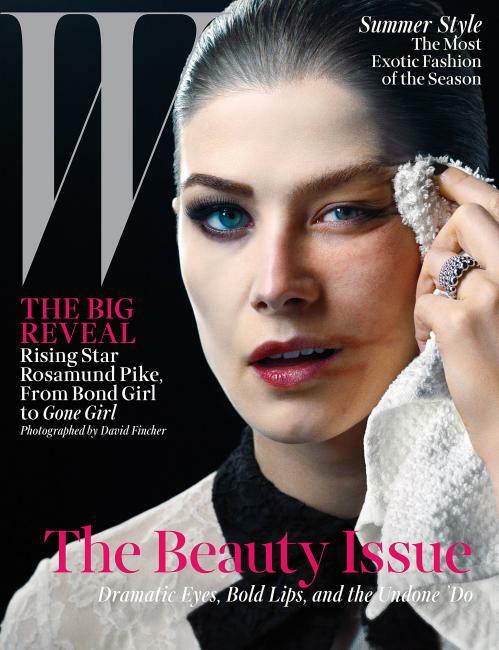 The May issue of W Magazine featuring actress Rosamund Pike is a great example 0f how sometimes, conventional wisdom is just conventional. 8) The August 28th cover of Bloomburg Business Week shows that while new Creative Director Richard Vargas may not be as whimsical as his predecessor, Richard Turley, he has no trouble making impactful and meaningful covers. 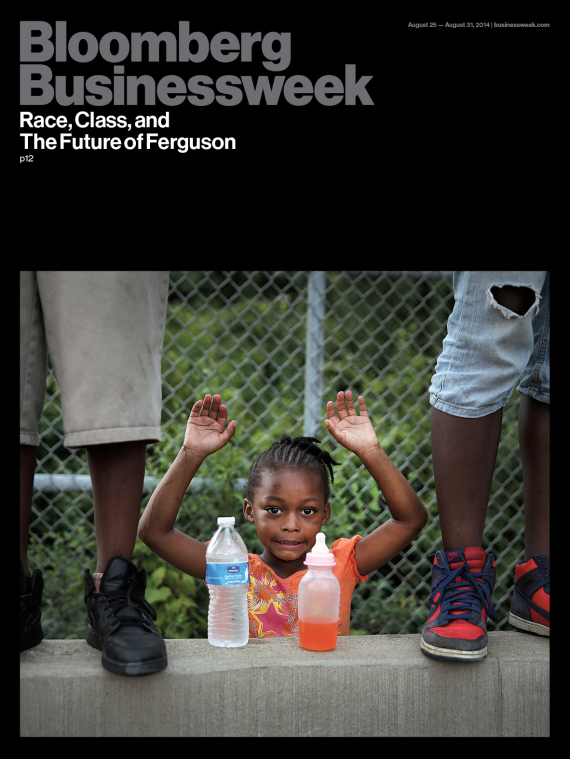 This cover shows the depth and breadth of the magazines coverage of the issues facing Ferguson, MO. 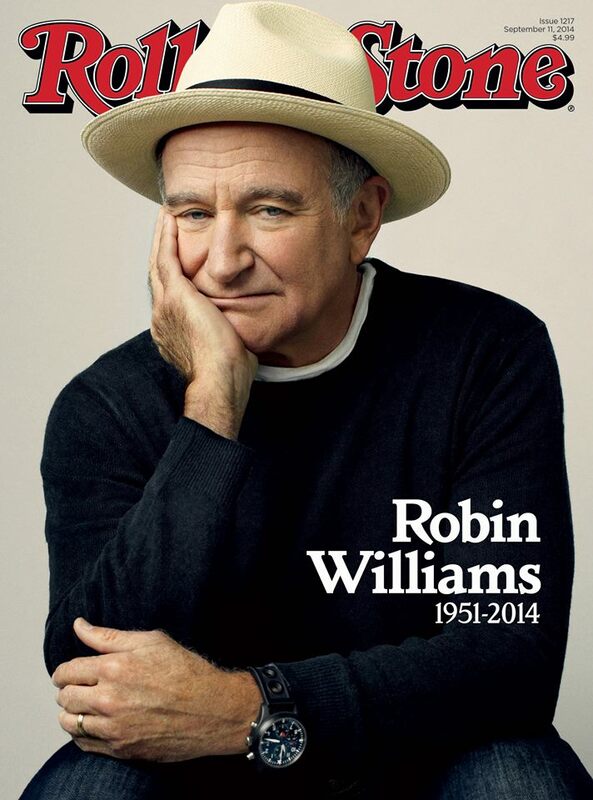 9) I counted at least six different magazines and book-a-zines covering the life and times of Robin Williams. But the best cover produced by a publisher of a regular frequency magazine was the 9/11 cover produced by Rolling Stone. 10) Tie between the June Marie Claire issue featuring actress of the moment Jennifer Lawrence, and the September/October Wonderland Magazine featuring former actress of the moment and current paparazzi fodder, Lindsay Lohan. These two covers are a really solid juxtaposition of a contemporary mainstream, big publisher title, and an upstart indie title. Both really stood out on the racks and took an interesting spin on their cover subjects. 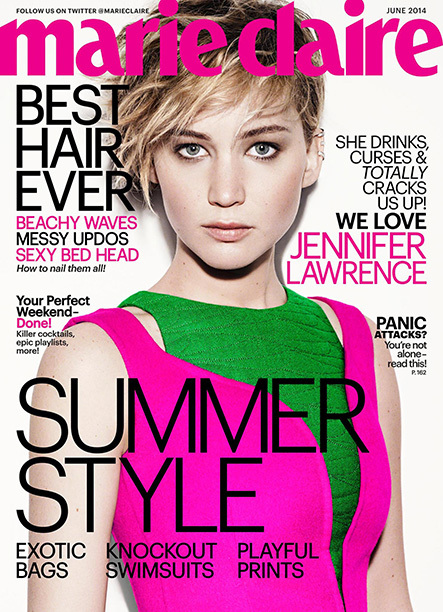 June 2014 Marie Claire featuring Jennifer Lawrence. There’s still two more months to the year and who knows what else will be coming along. What are some of your favorite covers? Editor’s Note: Music to accompany this post, courtesy of YouTube, the angel voiced Syd Straw and David Letterman. Another year, another add to the many “Best of” lists we get to read and enjoy. Late last week a colleague called me. He was full of laments. The year had started with such promise, he said, and ended on such a sour note. It felt like the wheels had completely blown off and everything was crashing down. Well, that seems a bit extreme. But if it seems to you that our shallow little bay of the great magazine sea is suffering from a bad case of the red tide, you’d be on target. In previous years, I’ve tried to judge cover selections by what conformed to some of the industry standards for cover treatment. Did the covers help newsstand sales? Was there a “good use” of cover lines or cover treatment? This year, in honor of declining sales, added fees, relaunches that exploded on the launch pad, I’ve gone more informal. The criteria (which I changed early on) is simple: What grabbed my attention when I walked by? So here they are in all their deck listing (at least by 30 degrees) glory: 2013’s Completely Biased, Highly Subjective and Unscientific Best Magazine Covers. 1) For the first time in two years, perennial winner, Vogue was not only tumbled from her top slot, but we don’t see Vogue anywhere in the rankings. Too much time in the checkout lanes scanning the iPhone? 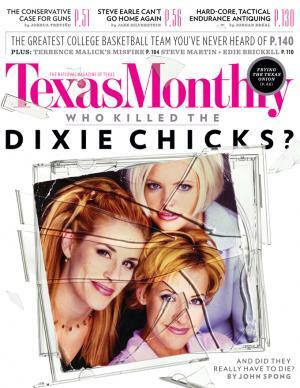 This year, the always fresh Texas Monthly takes the top spot with a look into the Dixie Chicks controversy. Great image, great cover lines, and bonus points for working the great songwriter Steve Earle into the skyline. 2) Here’s an interesting case of a magazine I didn’t see at retail (See, already broke my own rules). 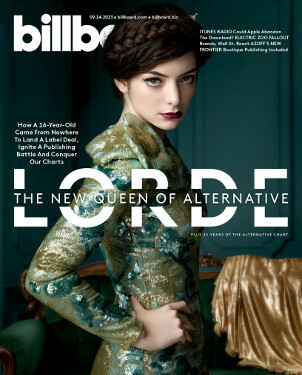 But I did see the image batted all around social media and my first thought upon seeing the cover was “Great image!” And then, Lorde’s new song turned into a earworm that would not go away. So does this Billboard cover set an example of a cover image that lives and promots beyond retail and print? 3) Cynics think that regional magazines are all about “Top Docs” and “Best Restaurants”. But regional magazines are so much more and the best can go far beyond simple service and feature journalism. 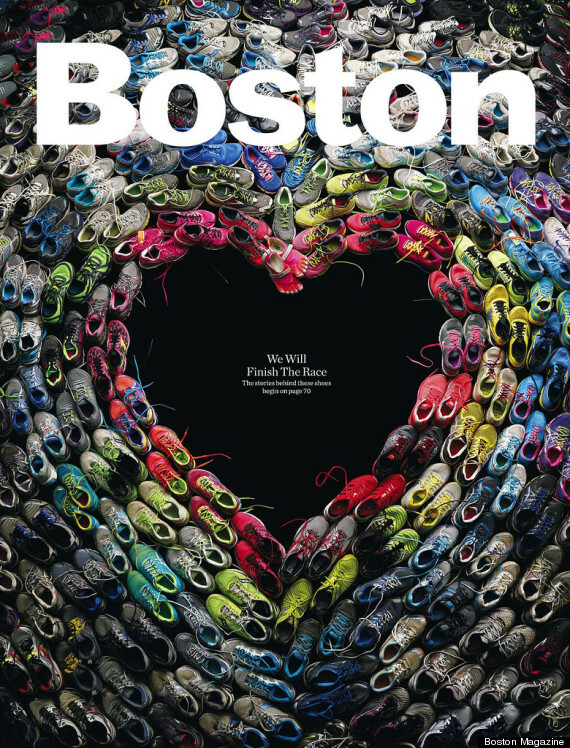 The May issue of Boston Magazine expressed everything that needed to be said about the marathon bombing. 4) I’ve never been a big fan of cover tabs and pop up images in the corner are even less of a turn on for me. 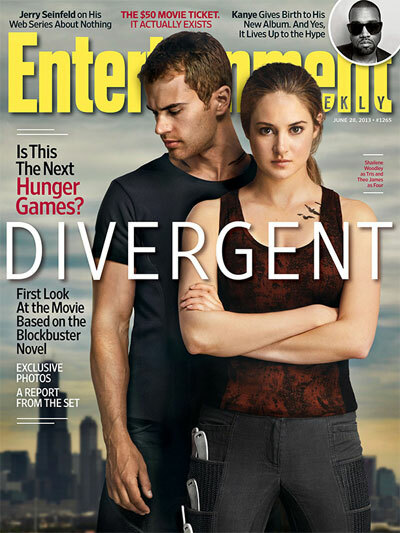 But my favorite magazine, Entertainment Weekly gets a nod this year for their excellent image featuring the upcoming YA adaptation of Divergent. 5) When I browse several nearby Barnes & Noble stores, I always scan the back of the racks where the imports are. I have a huge weakness for UK and Aussie titles. This year Love Magazine celebrated it’s fifth birthday and featured five unique covers to highlight the event. All of them are great. But this was the first one that jumped out at me and made me pay attention. Love Magazine (Conde Nast) 5th anniversary issue. 6) The kerfluffle about New York Magazine changing it’s frequency was really much ado about nothing, as far as I was concerned. Magazines change frequency. Business plans adjust to meet new marketplace realities. That’s life. But in the meantime, look and this cover and tell me it doesn’t make you smile! And want to do a selfie on a spacewalk! 7) A few months ago, I was in a local Walgreens when an older gentleman walked up to the counter and asked the cashier if they had TV Guide in stock. “No,” she said, “We don’t have anything like that.” Ouch! Well, in the last reporting cycle, TV Guide had a circulation of over 2 million, over 800K Twitter followers and more than 100K followers on Facebook. Is that has big as they used to be? No. Are they still in business and adjusting to new realities? Yes. 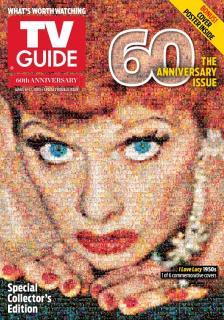 This year, they celebrated their 60th anniversary with a selection of really great covers. Here’s the one that took me in at first glance (on display in that Walgreens). TV Guide’s 60th Anniversary 1 of 6 covers. 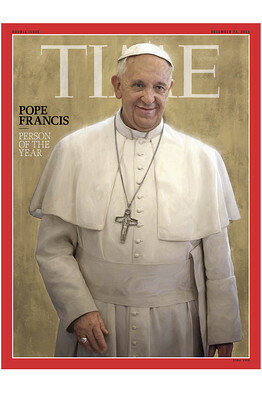 8) The “Person of The Year” is a big deal at Time Magazine and this year not only did they choose well, but they crafted a cover that really captures the image and humanity of the new pope. 9) I’m never sure what to conclude about this statistic. Outside Magazine’s single copy sales are about what they were when I worked at the magazine over twenty years ago. Whatever you conclude, the publication continues to create great covers with bold colors, great images, and clever, but not cute coverlines. 10) Who says newsweeklies can’t catch the imagination and inform the public? Bloomberg Businessweek continued to inspire this year with a series of creative, interesting and occasionally jaw dropping covers. This one really captures not only the content of their feature article, but really makes you laugh out loud. Want to see what the art director, Richard Turley is up to? You can follow him on Twitter @Mr_Turley. 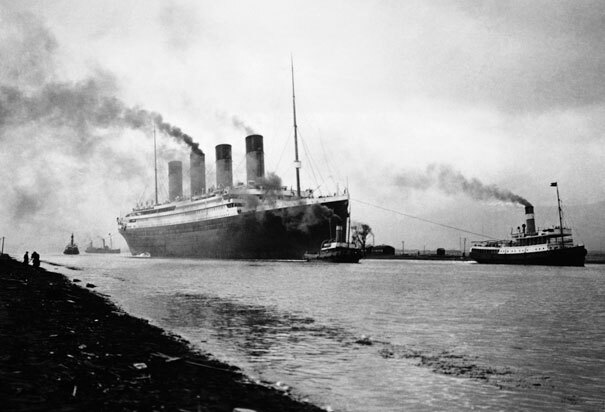 So for a moment, let’s drop the worry over where this ship is going. We pretty much know already. Let’s instead celebrate the great creativity that still exists in spades in this industry and the wonderful words and images we try to sell to the public each week. What covers grabbed your attention this year? Click here if you want to have your own copy of this years review of covers and see who I chose for the honor of “Runner Up”. Click here for the best of 2012 and here for the “Runners Up”. You can find the best of 2011 by clicking here. And for the very first cover review that ever appeared on the Foredeck, click here. Editor’s Note: An earlier draft of this post incorrectly stated that the single copy sales of The Backswoodsman had climbed from below 40,000 copies to 150,000 copies. The post should have stated that the distribution of the magazine had climbed from below 40,000 copies to 150,000 copies. That has been corrected below. My apologies for the error. If you’re deep into mainstream New York based slick glossy magazines, there’s not much for you here in The Backwoodsman Magazine. That is, unless you happen to have a life that’s lived in the outdoors. Perhaps you wish to live off the grid, be self sufficient and you want to know how to build a “Zeer Pot Refrigerator”. Or maybe you need to replace the gunwales on your canoe and you think you need to take a refresher course in winter driving. This thirty-two year old magazine is ably owned and edited by the Richie family of Texas. Compared to the latest Conde glossy, it is anything but cutting edge. In fact until six months ago, the insides of this title were printed on newsprint. The cover images are taken from outdoors art. They feature hunters, fishermen, trappers, Native Americans and scenes from the Old West. While the website is functional, the content is limited. However the e-commerce store is well stocked and easy to use. There are no apps. There is no digital subscription. 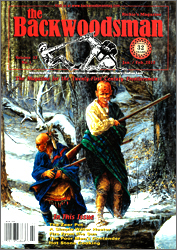 The Jan/Feb 2012 Cover of “The Backwoodsman” It’s more mainstream than you think. Most of the articles we see about print magazine circulation are about how sales are down on the newsstand and sub sides. Print is dead. No one wants to shop at bricks and mortar retail. The only place where most writers (and frankly most of the numbers) will grudgingly concede some sort of growth is in the Book-A-Zine category (aka the Zombies). But here’s a contradiction to that trend. 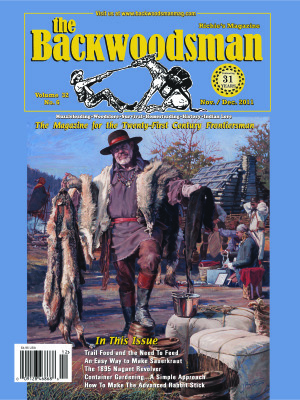 Seven years ago, this magazine, The Backwoodsman, was distributing less than 40,000 copies onto the newsstand. Nothing very big. The only saving grace for the title was it’s sell through in the mid forties. It was a candidate for the slow erosion and decline on the newsstand that we’ve seen for many other independently owned, middle of the pack publishers suffer through. But the exact opposite has happened to this title. This magazine has seen it’s newsstand distribution slowly climb from that sub 40,000 mark to 150,000 copies. All the while, it’s single copy sales efficiency has averaged 45% or better. Sales are up significantly. One answer is that the content in this magazine is something that people want. More and more people do want to be outdoors. Either read about it vicariously, or actually live self sufficiently. Many of the articles are written by the readers and it’s easy to see how intimate the magazine is with it’s audience. However in today’s newsstand world, a hot topic is not necessarily a recipe for growth. It also takes persistance. Newsstand circulation is handled by Irwin Krimke, a consultant and veteran of the Kable News book division and former national distributor ADS Publishing Services. When he began working with the title, about a quarter of the wholesale marketplace was not drawing the magazine and the former Anderson News had placed it on a highly restricted distribution. It’s very possible to look at much of today’s newsstand business and think of it like many other “push button” businesses. Communication is mostly through email. People hide behind voice mail walls. Distributions are worked through MagNet or a national distributor’s equivalent and submitted electronically. For most main stream titles, the ID wholesale market may be less than 5% of your overall sales. In this case, Irwin has steadily worked the the title’s distribution and pushed it’s national distributor, Kable Media to go after increasingly important chain authorizations. It took a long time, many submissions, and the retailers are now responding. Krimke works the wholesalers personally and has expanded the ID market. Retailers and wholesalers are paying attention to this $4.95 publication. Good content needs good editing. We hear the words “content” and “curation” tossed around like so many pennies these days. This publisher shows us that you need to know your readers, deliver articles they want to read in a format that the readers want to read them in. In this case ink on paper seems to do just fine. For others it will be digital. Figure it out. Deliver it. This publisher has his finger on the pulse of his readers. He’s delivering words they want to read and his audience has responded by growing. He has people on staff who pay attention to the circulation and he listens to them. You can grow on the newsstand. You just need to understand it, work it, follow-up on it, and keep working it. That was perhaps the best lesson I ever had in circulation and marketing. The Backwoodsman lives it every day. Anybody else out there have a circulation success story they want to share?